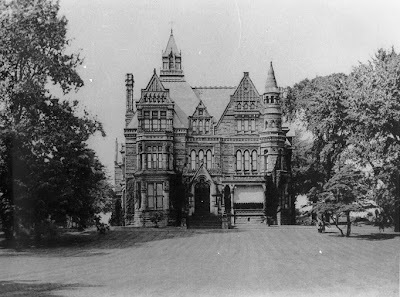 Yesterday, the Cleveland Clinic demolished one of the last vestiges of the once great Euclid Avenue, an impressive dark sandstone building at 1945 East 97th Street, designed by architects Hubbell and Benes for Hathaway Brown School in 1905. 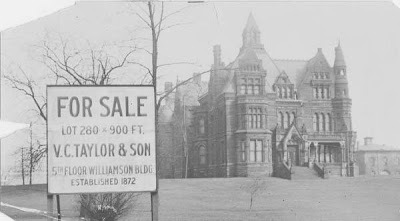 The school used this building as its home until 1927, when it moved to Shaker Heights. Some of the firm's other notable commissions include the West Side Market, the YMCA, and the Ohio Bell Building. The Clinic will soon, probably today or tomorrow, demolish another building in the complex, the home of Laurel School from 1909-1928. This is all that remained yesterday of the Hathaway Brown building. It is shameful that the Cleveland Clinic was unable to find an adaptive reuse for this historic structure. They've done an excellent job of repurposing the 1901 Henry P. White house, at 8937 Euclid Avenue. Surely they could have found a use for this structure of similar character. It has become clear that the Cleveland Clinic has little regard for the history of the area that has supported it and helped it grow. 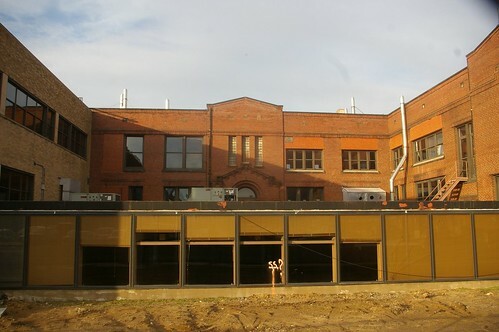 The last major building the Clinic demolished, the Ohio College of Podiatric Medicine, is now surface parking. While the need for parking is clear, I, for one, would be in favor of zoning variances allowing larger parking garages if it would guarantee the Clinic would save some of these buildings. Take another look at the Cleveland Play House. 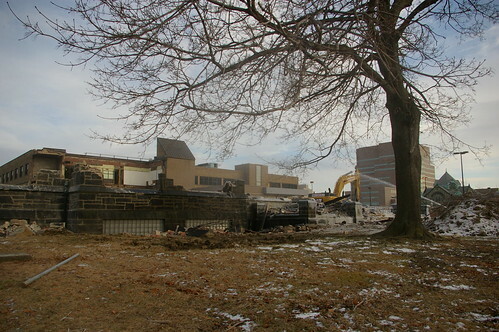 Is there any doubt that the Cleveland Clinic will demolish the structure as soon as they take ownership of it? Cleveland Memory Project director Bill Barrow has suggested that what Cleveland really needs is an identity. Something that incorporates its historic roots, its evolution, and its potential. A tall order, to be sure -- one that can’t fit onto a bumper sticker. An identity shouldn’t fit on a bumper sticker, anyway. An identity is fundamentally different from a marketing slogan, such as The Best Location in the Nation, or a brand, such as CLE+. Now don’t get me wrong -- marketing is vital to a city’s economic success. But Cleveland can’t find itself solely through the trumpeting of its positive attributes -- no matter how positive they are. It’s like casting a blind eye to your kid’s obnoxious nose-picking habit because, well, he’s your kid, and isn’t he precious? In pop psychology terms, it’s the difference between building up self-esteem and encouraging self-actualization. Understanding the city’s past is vital to constructing its identity. So the next logical step after a good, hard round of civic self-exploration is the construction of a cohesive civic identity. Something that won’t exactly fit on a bumper sticker, but could be summed up in 100-200 words. 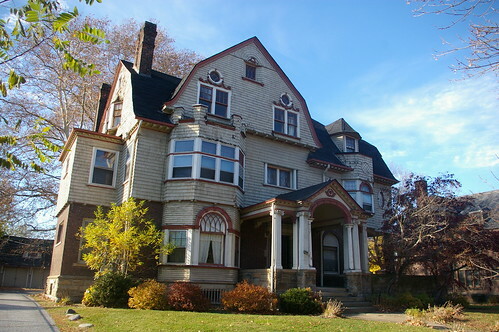 Back in November I posted a piece on the East 89th Street Historic District, a National Register of Historic Places Historic District, in Cleveland, Ohio. I lead with a picture of this house. At time, I referred to it simply as 1834 East 89th Street. Imagine my delight when I came across the following photo in Art Work of Cleveland (1911) in the Cleveland Public Library digital image collections. It is surprising how little the house has changed in the past hundred years. Usually, it is difficult to maintain a house with this level of detail. If we look closely at the photograph, there are only two areas where significant changes are obvious. 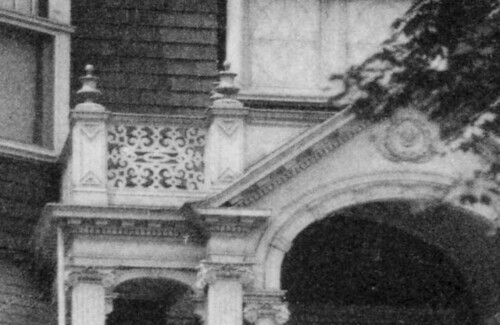 Over the front entryway, an ornate railing was originally present. A more simple railing was also present on the third floor, over the "tower". It seems likely that these two railings were removed due to difficulty of maintenance and decay. Overall, as mentioned above, the house is remarkably well preserved. Even the downspouts for the gutters are in the same location as the originals. The above citation, by listing the owner at the time of the pubication, gives us a start in learning something of the history of the house. 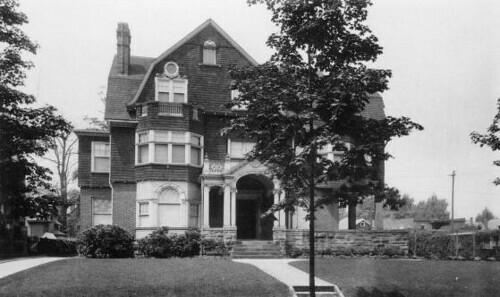 According to the Cleveland Necrology File, Edward F. Dyer, born in 1859, died in this house at 9 AM on Monday, May 7, 1923. He is buried in Lakeview Cemetery. He was the father of Herrick (or Harold) H. Dyer. Edward F. Dyer was the son of Ebenezer Herrick Dyer, who established the first commercially viable sugar beet mill in the United States. A historical marker in Union City, California, commemorates the site of the factory, on Byer's farm. Edward would go on to be an inventor and engineer for his father's company. The Builders of a Great City: San Francisco's Representative Men states "To the perseverance and pluck of Mr. Dyer, and the efficient assistance rendered by his son, Edward F. Dyer, who by his scientific and practical knowledge has made valuable improvements in the method of treating the juice of the beet, the industry in this country owes its existence to-day." 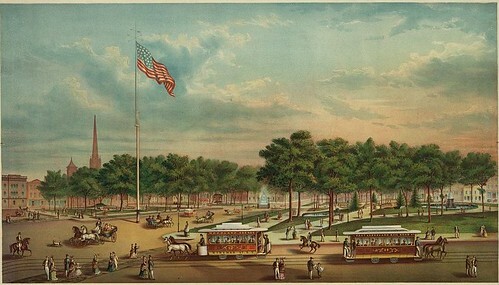 As of 1880, Dyer was still living with his parents, in Alameda, California and working as a secretary for the Best Sugar Co. The E.H. Dyer Co. had moved to Cleveland by 1901. Their offices were in the New England Building, on Euclid Avenue. The Sugar Beet Gazette refers to them as "the pioneer builders of beet sugar factories." Edward authored the 1903 book Designing, engineering, contracting, operating complete beet sugar plants. The 1910 Federal Census indicates that they had two live-in maids. As of February, 1917, he was listed as being a liftime memeber of the Cleveland Museum of Art. Who am I? I am a librarian and artist living in the Onaway neighborhood of Shaker Heights with my wife, one year old son, a cat, and three turtles. 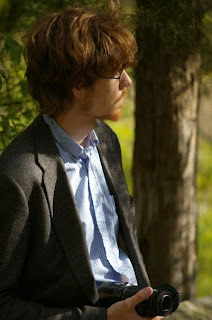 I've worked as a youth services librarian at the Hough Branch of Cleveland Public Library for a little more than a year. (Update: July, 2010: now at the Langston Hughes branch of Cleveland Public Library.) Before this, I spent three years as a librarian in the African American Department of the Enoch Pratt Free Library, the public library serving Baltimore, Maryland. I worked as a library assistant at Wickliffe Public Library while working on a Master's Degree in Library and Information Science at Kent State University, which I completed in 2005. While in grad school, I transferred and began the initial processing of the Performance Art Festival archives, a collection that I believe will come to be seen as the single most important archival collection in the fine arts for the 1990s. I earned a B.A. in studio art from Hiram College in 2003. As a librarian, my interests are many and varied. I could be happy in just about any subject area. Pressed for specifics, I'd cite art, history, rare books, special collections. My free time is divided between my son and working on my house, at least in theory. 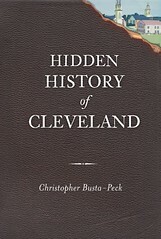 How did I get involved with Cleveland Area History? It began with a summer daycamp visiting the library for programming. An interest had been expressed in topics related to African American history. I quickly learned that local history programs worked well. Many of the kids hadn't been outside the neighborhood much, if at all, so stories about the things that happened on the other side of the city or in other parts of northeast Ohio might as well have been on the other side of the country. When I talked about things that happened right there in their neighborhoods, there was a glint of recognition. There was interest. The first significant program involved two African American writers, Charles W. Chesnutt and Langston Hughes. One important element in any program for children is strong visuals. I knew the Cleveland Public Library had an excellent collection of photographs of Chesnutt, his family, and his Cleveland residences, but I didn't have anything for Hughes. Colleagues at the Main Library were able to provide me a list of addresses where Hughes had lived in Cleveland, thanks to Arnold Rampersad's authoritative biography. I learned that of the five sites, all but two had been demolished. One was where Hughes had lived during one of the most formative times in his life, his sophomore and junior years of high school. It was at this time that he really began to write, as well as to forge important connections. The property had been foreclosed upon and sold at sherriff's sale. It was sitting vacant. If action wasn't taken, the house would eventually be broken into and vandalized. Water get in, and the house would come to be seen as beyond repair. Before long, it would succumb to the bulldozer. 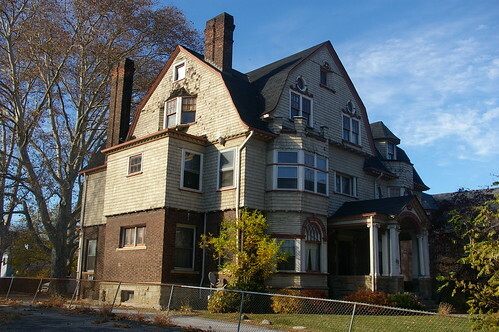 After a while of trying to convince others to save the house, I contacted a friend at the Plain Dealer, which ran a nice story on the house. This led to the eventual purchase of the house by Fairfax Renaissance Development Corp., which will rehab it and offer it to a low to moderate income family. All Things Considered ran a piece celebrating our efforts. My programs were successful in part because local history isn't done well in the schools or in the communities. People knew Hughes lived in the area, but not exactly where. I knew that there had to be plenty of other important old buildings and sites waiting to be identified. On a trip to Buffalo ReUse, an amazing architectural salvage yard and model we might do well to follow, I brought up the idea of a Cleveland history blog with Christine Borne Nickras. Though I blathered about it the whole way there and back, she didn't run away screaming. Two like-minded idiots on a mission. Why do I think Cleveland Area History needs to exist? I hope to change the way we percieve local history. I want to find better ways to share existing resources and present new ones. There are plenty of wonderful buildings in both the city and the suburbs that need our attention and that can be had for a song. I want to see more important old houses saved and fewer demolished. The pent up demand for local history information is clear. I see this as the venue through which it can be channeled.